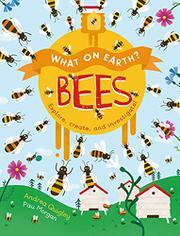 A green-themed instructive read, this will have nature enthusiasts buzzing. The cover tagline is “Explore, create, and investigate!” and that’s what young environmentalists may be influenced to do after working with this hybrid biology-STEM-craft-trivia offering. It combines educational tips with bee-themed activities that vary from scientific experiments (one encourages kids to observe what colors bees like best) to such crafts as “Make a Fuzzy Bumble Bee.” Quigley attempts to capture everything bee-related in this offering, and that all-in approach may overwhelm casual readers. Bee-themed poetry and Thai honeybee folklore intermingle with housing suggestions for bumblebees and recipes for seed bombs. Librarians and educators may find the book most inspiring, as swarms of bee-themed lesson plans and bulletin boards for the pre-K crowd fly off the page. An index and glossary make up the backmatter, but a pronunciation guide and list of further readings and citations would have sweetened the text. Morgan’s digital illustrations are bright and attractive, but readers may wish there were labels identifying specific flower names and geographic locations. For example, the map of “Bees Around the World” is more of a geographic suggestion that actual cartography. Morgan’s attempts to hint at diversity among the human characters are fair but limited—in a book this colorful, having only two skin tones seems uninspired.